Fives Landis Ltd. has secured a contract for eight Landis LT2e twin wheelhead CNC orbital crankshaft grinders, with one of the world’s most prestigious car manufacturers. 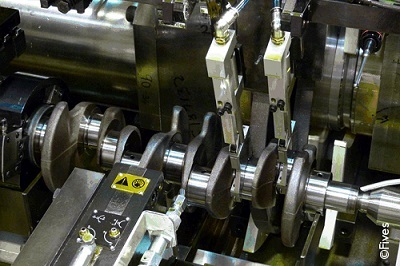 These customisable and flexible machines will grind multiple features in 3 operations on three, four and six cylinder crankshafts with an output of 200,000 units per year. The machines will grind journals and pins in one operation, thrustwalls and post in the second operation and flange and pilot bore in the third, with a cycle time of 72 seconds. These eight Landis LT2e machines have been tailored to the exact needs of the customer and come in many different variants including but not limited to: single wheelhead, swivel, four spindle and twin angle head - 5°.